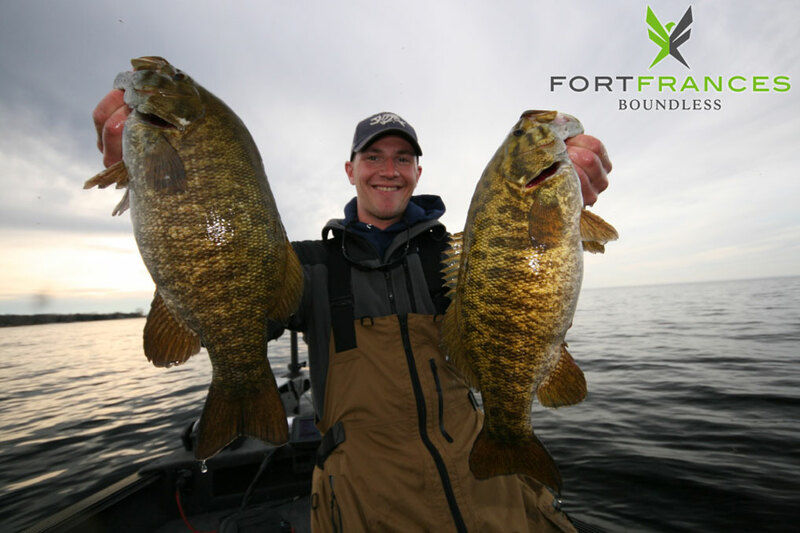 Rainy Lake is a premier fishing destination for Fort Frances residents and tourists alike. Whether you're looking to land bass, walleye, or a monster muskie, you've come to the right place. The district boasts a number of top-knotch fishing tournaments, fishing camps & resorts, as well as catering to avid local fishermen and women. Rainy lake is a fisherman's paradise and you won't leave disappointed! Smallmouth bass can be found in thousands of Ontario's rivers, creeks, and lakes. Largemouth thrive in warmer waterbodies with shallow cover. In lakes with diverse habitat, largemouth territory overlaps that of smallmouth bass, making for exciting angling action. Smallmouth are most active from late spring to late autumn and can usually be found in more open water or along rocky points, drop-offs, or shoals. When targeting smallmouth try curly-tailed jigs, crankbaits, shallow-diving spinnerbaits, in-line spinners, streamer flies, or crayfish imitations. Largemouth bass are most active from early summer to early autumn. They can typically be found in areas rich in aquatic plants, as well as in areas that have a lot of flooded stumps, logs, standing timber, and brush. Popular lures for largemouth are plastic worms, top-water lures, shallow-running crankbaits, weedless spoons, as well as buzz- and spinnerbaits. Live bait is also effective for both species. Leeches, minnows, and juicy night crawlers rigged beneath a float or with split shot on the bottom will draw strikes. Smallmouth are particularly fond of crayfish, especially soft-shells that have just moulted. Anglers can find these prized game fish province-wide, from the Great Lakes to shallow cottage-country reservoirs, from deep, powerful rivers to the loneliest waters of the Canadian Shield. And wherever they are, there's a great shore lunch just waiting to be had. Walleye are most active during spring and fall. It's best to fish for them at night, on overcast, windy days, or in stained water, as the walleye's eyes are specialized to help the fish feed in low-light conditions. Many anglers catch walleye by trolling after dark with crankbaits along weedlines, rocky points, and over sunken reefs. Some of the largest walleye are caught this way during evenings of a full moon. During the day, walleye can often be found in deeper water over rocks and in weedy cover. Then, one of the easiest and most effective tactics is to drift and jig just off bottom over likely cover until you locate a school. Some anglers prefer to troll using spinners, spoons, and deep-running crankbaits. Others specialize in the delicate presentations of minnows, night crawlers, crayfish, or leeches. Walleye are a schooling fish, so it's a good idea to throw out a marker once the first fish is caught. Once located, casting to the school can be quite productive. Though rare, muskie exceeding 70 pounds (31.8 kg) still roam our waters — so, in prime habitat, you never really know if you're going to experience a relaxing day of fishing or set a new world record. It's best to fish for these powerful predators after the season opens in June and again in September when water temperatures begin to cool. July and August, however, produce substantial numbers of small to medium-sized muskie. Key fishing times during the day include morning and evening when baitfish activity peaks, and between 1 p.m. and 4 p.m. In many lakes, muskie are also active for a few hours after midnight. Effective lures for muskie are large surface or diving lures, spoons, and bucktail spinners. They also like live bait such as suckers, chubs, and frogs. Don't forget landing and release equipment. Muskie are powerful fish with razor-sharp teeth. Care must be used when handling them to avoid injuries to both the angler and the fish. Ontario has the finest northern pike fishing on the continent, with waters where ducklings are nervous and 30-pounders (13.6 kg) prowl. Spring, early summer, and fall are peak periods in southern and central lakes for trophy northern pike fishing. At ice-out in spring, northern pike begin to spawn. This occurs in the weedy shallows as early as March. Prime locations to fish when angling seasons first open are weedlines, flats, points, and creekmouths. As the water heat ups, northern pike shift to deeper water with submerged weedbeds or other forms of cover or structure. During this period, deep-water trolling is your best bet. The most effective places to fish during summer are along the edges of weedbeds, drop-offs, points, islands, and humps. In autumn, when water temperature drops, northern pike become very active again. They return to the weedy shallows, rocky bars, or below rapids in rivers or streams. Effective northern pike lures include large spoons, noisy surface or diving lures, or bucktail spinners. You can also use live bait such as shiners, frogs, and large chubs.